The Amtrak Century fills very quickly every year. To expedite the registration process, please review the following information before registration opens. You should create an "ngin" account prior to registration. Please see below or the FAQ area. The link for creating the website account is located in the upper left area of the website. You will be sent a confirming email to confirm your identity. Click on the link inside the email to confirm the receipt. This will prolong your registration process if you don’t do this ahead of time. We will be grouping the clubs and cycling groups for the return train ride. You will be assigned to train cars based upon your biking affiliation. If you want to be in the same train car as your club/friends, please coordinate with a common group name to be used during the registration process. If you check the wrong group and missed it in the review, Email Jim Walker for correction. 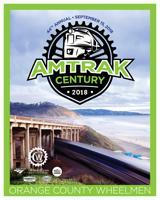 All communication for the Amtrak Century is conducted by email and will come from teamwalker@ocwheelmen.org , events@ocwheelmen.org or mike.lee@ocwheelmen.org. If you are using any type of spam blocker, then you must allow access to these email addresses. You will NOT receive your registration confirmation or any subsequent communication about this event unless your email address is valid and unblocked. Due to heighten security on Camp Pendleton this year, we are required to provide more personal detail. Two additional mandatory fields have been added, Middle Name and Camp Pendleton ID. If you do not have a middle name, enter "None". For Camp Pendleton ID, enter your State ID number or State driver license number with all characters as shown on your ID. Without this information you will not be able to complete the registration process. Your ID information has to be current and is subject to validation at the entrance gate. To register for the Amtrak as an OCW Member you must know your website login and password. To check before registration you should login to the OCW website at www.ocwheelmen.org. Enter your Account ID and Password and login. If you can login you are set! If you can not login, see information below. If you carry only a website user account see the home page to identify your user id. Passwords are not retrivable by webmaster, click the forgot password link. For OCW members verify in the Members Only tab that your data is correct including your email. If changes are required please see the FAQ area to learn how to resolve. If you have a Family Membership, check and update all family members. The e-mail address is VERY important! Your e-mail address cannot be changed during the registration process. If you can not login, click on Forgot Password. Your OCW password will be e-mailed to you at the e-mail address currently in the OCW database. If you still can not login, contact mike.lee@ocwheelmen.org. All OCW members will receive a discount code to be used in the shopping cart area. That code will be available one week prior to registration. See the Amtrak link "Discount Code" This link will only be visible to OCW ACTIVE REGULAR MEMBERS that have logged into the website. If you do not enter the discount code you will be charged as an Associate Member. Create an ngin account. See upper left link to create an account. You will be sent a confirming email link. For more information refer to the FAQ area. Although any unique userid that has not been taken can be used. If taken you will be adivised if already used. YOU WILL ONLY BE ABLE TO REGISTER ONE RIDER PER WEBSITE ACCOUNT LOGIN ! We found that the method used in a previous year left many riders not receiving email notifications due to the nature of this website. WE CANNOT CHANGE THIS. Please if you cannot register on opening day have a friend or family member register you.